This post is my tribute to Strange Pixels. 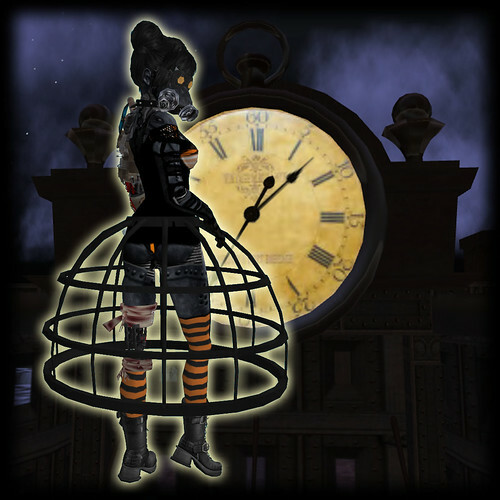 I love many things about this Second Life blog, especially that the outfits always tell a story. Grady is the armored one. Her tales are of clomping through the wastes of Second Life, protected to the gills (and eyes). Mourna is the ethereal dark fairy one, floating in her tattered cuffs and crinoline, reflecting a lost mythic world. Dancien is the boy, but he is more than simply a cavalier and prop; he writes to a punk and dangerous vibe, the softness of his lipstick belying the toughness of his attitude. The three of them write photo-essays that go far beyond fashion and end up wiggling their ways into my imagination. To you three: L'chaim! Thank you for the constant inspiration. Ehehe, I wasn't braining very much, it's a short tribute. But I'm happy you like the post. Eheh. Now I dunno what to say. I appreciate it! What if we all wore the same damned thing?